The optical spectrum (or emission spectrum) of a light source or some beam contains information on how the optical energy or power is distributed over different wavelengths. Usually, it is presented in the form of a diagram where the power spectral density (not necessarily with an absolute calibration) is plotted as a function of the wavelength or optical frequency. 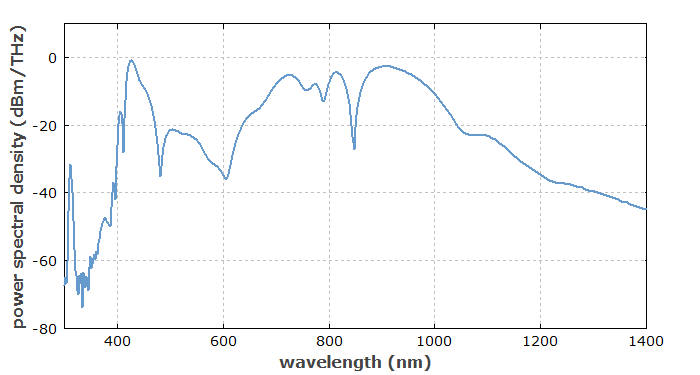 As an example, Figure 1 shows the numerically simulated optical spectrum of a supercontinuum source. In contrast to that very broad spectrum, the optical spectrum of a single-frequency laser source is often characterized by a very narrow line – in extreme cases, with a linewidth of the order of 1 Hz, corresponding to only ≈ 3 ·10−12 nm (for 1 μm center wavelength). Other lasers have a spectrum consisting of multiple lines, and some (particularly mode-locked lasers for ultrashort pulses) can have a large spectral width of 100 nm or more with a frequency comb structure. Figure 1: Numerically simulated supercontinuum. See the article on supercontinuum generation for details. Optical spectra can be recorded with different types of spectrometers (e.g. spectrographs), which greatly differ in terms of the covered spectral range and the spectral resolution. The optical spectrum is intimately related to the temporal coherence properties of the light. For example, the temporal coherence function fully determines the spectrum. The optical spectrum is also related to the Fourier transform of the electric field, although the latter is in most cases not directly accessible. Therefore, it is also called the Fourier spectrum of the optical field. The optical bandwidth is essentially the width of the optical spectrum. There are different definitions, but the full width at half maximum (FWHM) is often used. Some optical sources such as incandescent lamps, light-emitting diodes or superluminescent sources have a very smooth optical spectrum. However, other sources can have spectra consisting of closely spaced narrow lines, which can be resolved only with a spectrometer having a sufficiently high spectral resolution (small resolution bandwidth). In case of a continuous-wave laser with multimode emission, but only on fundamental resonator modes, the lines in the spectrum are approximately (but not precisely) equidistant, with a spacing which typically corresponds to the inverse resonator round-trip time and is in the megahertz or gigahertz region. (The round-trip time can be frequency-dependent due to chromatic dispersion, and nonlinearities may also affect the mode frequencies.) If the laser also emits on higher-order transverse modes, there are additional intermediate lines (related to the Gouy phase shift), so that the line spectrum is denser and not equidistant. Any mode-locked laser, however, produces a frequency comb spectrum with exactly equidistant lines, apart from some laser noise, which is often very weak. Optical spectra can be recorded with instruments which are called optical spectrum analyzers. They are often a kind of spectrographs, but there are other kinds of spectrum analyzers based on completely different operation principles. For example, there are interferometric devices, using either Michelson interferometers or Fabry–Pérot interferometers. Spotlight article of 2007-10-11: "Understanding Fourier Spectra"